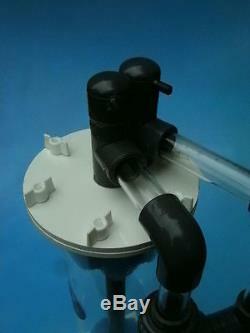 Cleartides : N350 (Full Kit) For use with both Marine and Freshwater Aquariums. For 0 - 90ppm nitrate systems The Cleartides Fluidised Nitrate Reactor 350 are suitable for aquariums up to 350 Gallons / 1500 litres. This recirculating Nitrate Reactor by Cleartides comes complete with two media's and pump to keep the media turning over and allowing this unit to be one of the must efficient Nitrate reactors on the market. This kit doesn't require any additional pump supplies... Water is draw and exits the reactor through the use of the pump supplied. Running this N350 will not only decrease nitrates (if not eradicate nitrates) within your system, will also add Minerals and calcium into your system through the dissolving of the calcium. Also due to its pressurised design allows you to sit the reactor in sump or free standing..
And can be used without a sump all together... Pushing the water flow back to the aquarium above, while sitting in the cabinet. N 35 0 Reactor, Pump. Works with both 110/1 2 0 volt/60 hertz and 220/240volt/50 hertz systems. Nitrate & Calcium media's, Control Valve and 2 metres of piping. The Nitrate (yellow) media will last from 2-4 yrs... And the calcium will last around 12mths before requiring topping up. 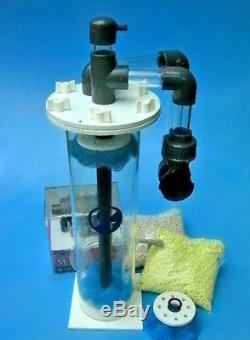 The item "Nitrate Reactor N350 (1500l). Full Kit" is in sale since Monday, March 02, 2009.